Based on the process engineering developed by the Fraunhofer Institute for Chemical Technology (ICT) in Pfinztal, Germany to consolidate UD tape supports, the press manufacturing company Wickert has developed a flexible system suitable for trial composite operation. At the end of 2014, Wickert delivered a high-temperature contact heating table that allows processing temperatures of up to 425°C to the thermoplastics processing (TP) working group in the Polymer Engineering Department of Fraunhofer ICT. One of the research focuses of the TP working group is local continuous fiber reinforcement, which also covers the processing of continuous fiber reinforced semi-finished products such as UD tapes. “In the past, the most you could process was fabrics made from technical thermoplastics such as polyamide (PA) 6 or PA 66, but the market now requires increasingly high-performance matrices,” said Raphael Jauch, Project Manager at Fraunhofer ICT. His aim is to be able to process tape materials with matrices from high performance thermoplastics such as polyphenylene sulfide (PPS) or polyetheretherketone (PEEK), thereby entering a new dimension in applications. Fraunhofer ICT houses the entire process chain under one roof. The fabrics are manufactured at the Augsburg site by the Functional Lightweight Design project group (FIL). Here, the UD tapes are processed into the desired reinforcement structures in the so-called RELAY process (Rapid Efficient Layup) with any given layer set-up. The UD tapes are placed precisely on a moving table in layers and “spot-welded” using ultrasound. The orientation of the tape, and therefore the fibers, can be set in an infinitely variable way by rotating the table and can therefore be adjusted optimally to any load. These fabrics are then processed further and consolidated in a two-step HTP (heat/transfer/press) process. It is here that the newly developed high temperature contact heating table from Wickert comes into play, heating up the fabrics before they are pressed. In order to manufacture high quality laminates and reproducible properties, the individual layers must be bonded together in this process step without any air pockets. The decisive factors when it comes to heating the fabrics include homogeneous temperature distribution and high plane parallelism for the heating plates, explained the company. This new systems engineering now allows the production of laminates based on high performance thermoplastics like PPS, PEEK or polyethylenimine (PEI) that are of great interest to the automotive and aerospace industries, both in terms of material characterization and further processing into complex high temperature components. High processing temperatures is a crucial regulating factor for reliable processing of these fiber composite thermoplastics. 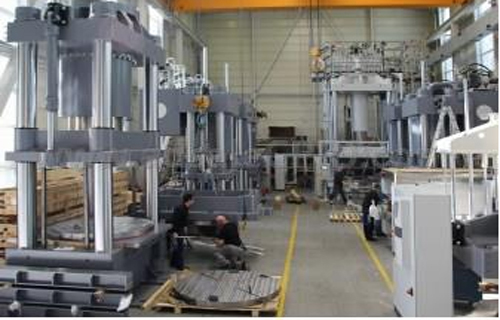 The maximum product dimensions that can be processed are approximately 1,100×1,100mm. With a heat output of 2x50kW, the maximum temperature of 425°C can be reached quickly from room temperature, said Wickert. Both heating plates are equipped with six-zone temperature control designed for quick and easy-to-make material-specific adjustments. As said, the control accuracy of the heating element zone monitoring system is +/-1.0°C. The contact heating table can be time or temperature controlled, offering high flexibility and product reproducibility. All process-related data, such as the target/actual temperatures of the heating plates, product temperatures, heating and stop times and the entire cycle time, are recorded, monitored and displayed. “The system we have delivered is one that is tailored individually to our needs and is ideally suitable for the intended processes,” said Mr Jauch.